Nothing says comfort food like roast. Roast is a traditional British meal served on Sunday’s, but came to America and quickly became a New England favorite. Since then, Mississippi has laid claim to their own version and the majority of American homes have their own recipe that they’ve grown up with. Typically served with potatoes and carrots, the recipe is very versatile and can be made in a crockpot, pressure cooker, or braised in the oven. The meat is typically a rougher cut, but by slow cooking it, it becomes melt in your mouth tender. Top it with gravy, and it’s heaven bliss! For this elk roast recipe, you can use the same recipe for venison, bear, or moose. To me, roast has always been okay; in other words, it was just a way to get rid of some of those tougher cuts of meat, but it was never something I craved. That is, until I finally figured out this recipe. This elk roast recipe is so flavorful, I often catch the hubby eating cold leftovers from the fridge, and the gravy could be eaten with a spoon. It is simply divine. I’m sure you’ve heard of using onion soup packets in your roasts, which is fine, but it’s hard to control the sodium level. Instead of using those packets, just use sliced onions (shocking, I know). No reason to get fancy with any other ingredients if you use this recipe, the onions and spice/herb combo work perfectly together. Also, I usually cook my veggies outside of the crockpot or pressure cooker, because I like to control the texture of them. I don’t want them to crumble and fall apart, so I like to cook them on the stove top while the elk roast cooks. This doesn’t mean you can’t throw your veggies in the pot though. If you’re good with veggies cooked to a fall-apart consistency, go ahead and throw them in. Pressure cookers seem to be a bit more forgiving when it comes to overcooking the veggies, so it’s a much better texture. Why Brown Roast Meat Beforehand? I hate when I see a recipe that is supposed to be fast and it calls for all of this prep work, like browning the meat before cooking it, but there’s got to be a reason for that, right? Well, technically, you don’t have to brown meats before slow cooking them. The time spent cooking will cook the elk roast perfectly fine, but I’ve always been a fan of the benefit of browning the meat beforehand was to add a caramelized flavor to the entire dish. The technical term for this added caramelized flavor is called the Maillard reaction, and if you ever want to really be a meat cooking enthusiast, you should probably understand what that reaction means to cooking your meats. BUT, with all of this said, there are people on either side of this argument that bring up great points to whether it is necessary to brown or not brown. I like this argument for browning beforehand by one of my favorite foodie blogs, Kitchn, and I also like this argument against browning beforehand by another one of my favorite foodie blogs, Serious eats (Kenji is a favorite of mine, for sure). Again, know it’s okay to not brown, and I’d recommend trying both ways to find out your favorite. Should You Drain Blood from Wild Game? We try to trim as much of the silver skin away from the meat, which typically helps with any gamey flavor, but for an extra step, the hubby likes to sit the meat in a colander that is then sat in a bowl. He then places the bowl in the fridge overnight. This helps drain some of the blood away, which is just another step to getting rid of that gamey flavor. If you don’t have time for this step, no worries if the meat was properly trimmed, but if you’re finding that your meat does have a gamey flavor, this may help. For braising in the oven or crockpot instructions, scroll to the bottom of the recipe. 3 slices Bacon Cut into 3 pieces. 3 lb Elk Roast Venison, moose, and beef work well too. Salt + Pepper To taste, and use Kosher salt. If you have time, drain the elk roast in a colander set in a bowl overnight to try to get some of the blood out. Turn on pressure cooker so it gets hot enough to cook the bacon and brown the meat. Par-cook the bacon slices in the bottom of the pot. What you're looking for is there to be enough grease left over to brown the meat and cook the vegetables. This step probably takes about 5-8 minutes. Shake some salt and pepper all over the elk roast - feel free to use a generous amount; if the elk roast is thick enough, a thick crust of salt and pepper will make it wonderful! Kosher salt, not table salt. When the bacon is done, remove it and set aside. Add the elk roast to the pressure cooker to sear and brown on all sides in the bacon grease - about 5 minutes per side. You may have to do this in batches if you're doing multiple roasts (like with smaller venison roasts). If you haven't already, use this time to chop your onions, chop your garlic, and slice your mushrooms. Add the elk roast back to the pot, top with bacon, and add the remaining ingredients (but not the corn starch). 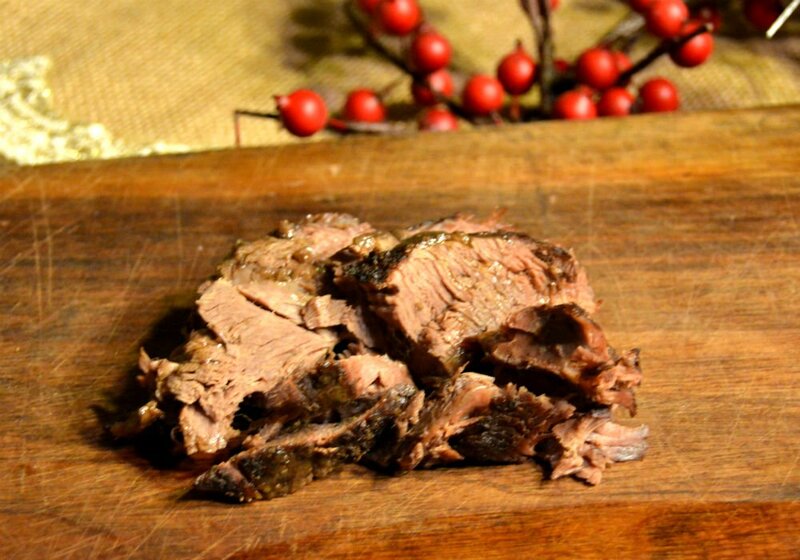 Cook the elk roast in the pressure cooker for 1-2 hours. Release the pressure, and then check the cut of the elk roast and decide if you want to cook it a bit more. Once the elk roast is done, remove the roast to a cutting board, turn up the heat on the pressure cooker (no lid needed) to start boiling the liquid. Take 3 tablespoons of the juice and add it to a small bowl. Stir the 1 tablespoon of corn starch into the juice until well mixed. Pour the corn starch mix into the elk roast juice, and stir to incorporate. Let this mixture boil until thick - this usually takes the time it takes to cut up the elk roast. Slice the elk roast and serve the gravy on the side as an option to pour on top. The gravy is so good, it could be it's own side. If you're cooking this elk roast recipe in a pot instead, cook for 3-5 hours in the oven at 275°F with a tight-fitting lid. If you're cooking it in a crockpot, set it on low and let it go all day. A buddy got an elk last week and, lucky us, didn’t have room for half of it in his freezer. I made this roast last night and it was hard to stop eating! The gravy is to die for. I had home made bone broth and used a Cab. When we run out of elk had have to go back to beef, this will be my new roast recipe. Thanks. Yay, I’m glad you liked it! I’m going to have to make it again soon, that gravy could be eaten like soup! 2-3 HOURS!?? Seems like that would result in dry, cardboard textured meat. You’re making me second guess myself! I’ll make it again tomorrow for dinner and do a taste test, but if I remember correctly, the 1 hour mark didn’t leave the roast tender enough. So, I cooked this again tonight in the instapot pressure cooker, and then took it out at the hour mark, sliced it, and tasted it. The hubby and I both thought it could cook longer, so it went back in. I also did a bit of research on cuts of meat for roasts and the timing could depend on where the roast cut came from on the animal; in other words, the roast could be more or less tender depending on where it was cut from. With that said, perhaps the best answer is to taste it every hour and see what you think as far as tenderness. I also cooked this with another roast and it did turn out too dry after two hours. I’ll make an edit to the recipe. Thanks! I am cooking one today for Christmas dinner; it doesn’t have a guide,one for cooking in an oven. ?any help? So yummy! I didn’t have mushrooms, but it was still delicious without. Next time I’ll reduce the time to 90 minutes (I did 120 minutes, and we live at 6500 ft which affects the time, too). Thanks for the recipe! I find one of the best ways to remove gamie flavor along with removing silver skin, is to brine your meat in salt water. I will do this 1 hour up to 12 hours, and love the results. Meat is never dry, full meat flavor comes through instead of the gaminess that can happen.